NetEase is on track to profit from a growing end market for gaming and a strong intellectual property portfolio. NEW YORK (TheStreet) -- NetEase (NTES - Get Report) is on a roll this year. Shares of the Chinese online gaming company have appreciated about 48% so far in 2015, driven by solid growth in the company's mobile games and what are known as massively multiplayer online role-playing games, or MMORPGs. These two factors led to a massive 54% year-over-year jump in revenue in the last reported quarter. But, if you're thinking that you missed the boat, there's still time. NetEase is plying its trade in a fast-growing market, and more importantly, the company is diversifying. As such, investors can expect more upside going forward despite the stock's impressive rally this year. Let's take a look at the reasons why NetEase is primed for more upside. The market for 3-D MMORPGs in China is growing fast. They currently make up 60% of China's online gaming base. Now, the market size of online games in China is slated to go up to $40 billion in the next couple of years. This means that the market for 3-D MMORPGs in China could be worth as much as $24 billion at the current market share. 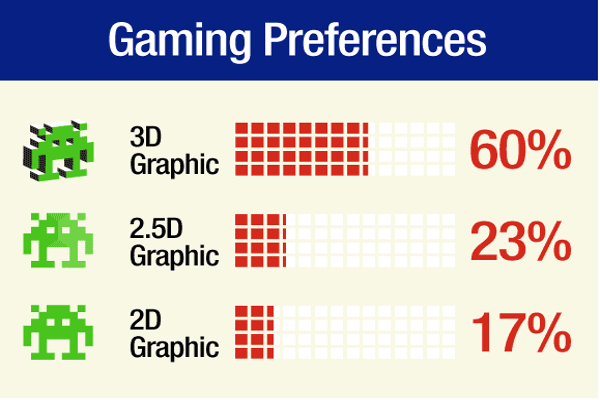 From the above graphic, it is evident that 2.5D and 3D games in China account for 83% of the online gaming market, which is anticipated to grow at a rapid pace over the next couple of years. NetEase has chalked out a smart strategy of developing new games in these genres in order to attract new gamers, even as it issues expansion packs to serve the current user base. For instance, NetEase recently released the expansion pack for Tian Xia III, its 3-D MMORPG game, and another one is expected in the ongoing quarter. Looking ahead, NetEase has planned a series of newly developed games to be released throughout 2015. This includes Revelation, which is a 3-D oriental fantasy MMORPG whose beta testing was concluded in January 2015. Meanwhile, Hegemon-King of Western Chu is a 3-D warfare MMORPG also set for release shortly, as NetEase recently finished the beta testing of this game. NetEase is not losing sight of the 2.5-D MMORPG market either, as this accounts for 23% of China's online gaming market as shown above. To tap this market, NetEase recently released Demon Seals, a 2.5D MMORPG game, last month. The good thing is that the game seems to be gaining strong traction due to its high-quality graphics and fast-paced action. Gaming site freemmostation.com likens it to Activision Blizzard's (ATVI Diablo. That's a good thing as Diablo III has sold more than 20 million copies in the past three years, becoming the best-selling PC game from Activision last year. What's even more encouraging is that NetEase has partnered with Activision to operate the Chinese version of Diablo III: Reaper of Souls. NetEase said that it sold more than a million copies of this game in just 10 days after its launch last month. In fact, Reaper of Souls has become the fastest-selling PC game in China. Going forward, NetEase will try to sustain this momentum by starting the beta-testing for Activision's Heroes of the Storm this month. All in all, NetEase has strong prospects, it has built up a strong portfolio of games and is fundamentally sound. Investors should continue holding it in their portfolios as it is capable of going higher. Tesla founder Elon Musk might see some "merit" in raising capital to support his loss-making company, but a long-time critic of the controversial CEO thinks the group's latest earnings miss signals financial distress, not near-term profitability, for the clean-energy carmaker.